The email practices of real estate professionals are under scrutiny as NBC Bay Area investigates an increasing number of wire fraud scams stealing home buyers' down payments. As more Bay Area home buyers fall prey to a fast-growing real estate scam, new victims are coming forward — and demanding answers from the professionals who they say failed to protect them. NBC Bay Area first reported on the expanding problem of real estate wire fraud in June. Since then, three more families have come forward to NBC and our partners at Telemundo 48, to share their stories of losing tens of thousands of dollars to thieves. Among the latest victims is Maria Lopez, a Napa retiree. She now finds herself caught up in a costly home purchase gone awry. "I have absolutely no savings," Maria said. "So, if something happens, like if my car breaks down, I have no money to pay for that." Maria did have savings — until someone stole it. Over the summer, she tried to help her son buy a house in Sacramento. Lopez scraped together $85,000 for the down payment. But internet thieves spoofed her real estate agent's email account, and took every penny. "I never realized that it wasn't his email," Maria said. "There was one letter missing." Shown here are the real estate agent's true email address, and the one created by the imposters. Would you be able to spot the difference at first glance? They're identical — except for one letter R. Lopez missed that tiny detail, so she followed the phony instructions and ended up wiring $85,000 to a stranger. Lopez says she was stunned when the title company handling the transaction told her it never received her payment. "That's when I realized something bad had happened," Lopez said. "I said, 'How can this be?' They said, 'Well, you know there's a lot of fraud going on.'" Hackers targeted a San Jose couple and got away with their life savings when they tried to buy a home out of state. Now they face homelessness, and they say no one is taking responsibility for the theft. Avoid free web-based e-mail accounts: Establish a company domain name and use it to establish company e-mail accounts in lieu of free, web-based accounts. But NBC Bay Area learned many real estate agents keep using those same "free, web-based" email accounts. We combed through thousands of agents' email addresses. We started where an ordinary home buyer might: the "Find a Realtor" page on the Santa Clara County Association of Realtors' website. Our team checked more than 6,000 agents' contact information. More than half listed accounts like Gmail, Yahoo! Mail, Outlook, and AOL. 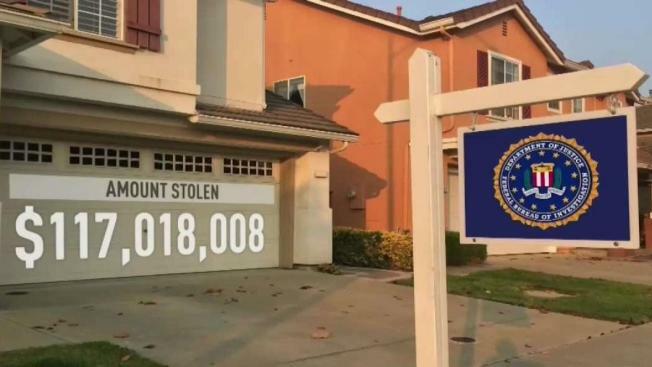 That's more than 3,000 South Bay Realtors using free email accounts that the FBI tells them to avoid. We asked Dave Walsh, treasurer and president-elect of the California Association of Realtors, how many Realtors should be using those kinds of email accounts. "None," he said. "Zero. Not one." Walsh says agents get regular warnings about the growing real estate wire fraud hoax. The California Association of Realtors has also added a scam advisory to the standard homebuyer contract, used by most real estate agents statewide. But if Realtors are aware personal email accounts are vulnerable, why do so many continue to use it? Walsh has a hunch. "They've always done it that way, or that's their favorite email address," Walsh said. Others in real estate told NBC Bay Area, off-camera, that many agents' livelihood hinges on their contacts. Changing their longtime email address to protect new clients today might cost them a deal tomorrow. That excuse doesn't fly with Dan Sandri, Acting Commissioner of the California Department of Real Estate. "It's kind of a ridiculous decision to make, given what can happen," he said. Sandri says real estate agents who don't protect their clients could be investigated for negligence. "When you're acting as an agent for a buyer or a seller, you're acting in a fiduciary capacity," Sandri said. "You're supposed to put the client's interests above your own." We asked Sandri if real estate agents holding on to unsecure web-based email accounts, just to keep track of their contacts, would be acting in their clients' best interests. "I would say no," Sandri said. Sandri told NBC Bay Area he's not aware of any California real estate agents losing their licenses for using web-based email. But he encourages victims of real estate wire fraud — like Maria Lopez — to file a formal complaint, for his office to investigate. That's encouraging news for Maria, who says the real estate industry fell short of its obligation to protect her. "Everybody's saying how bad they feel," Maria said. "Nobody has the compassion to do something about it." Maria was still able to help her son buy the house he wanted. But she had to drain the rest of her savings. When it was time to close, they transferred the money in person — not electronically. She feels that's the onyl safe way to buy a house today, because the real estate world isn't taking this costly scam seriously enough. "They failed to protect our money," Maria said. "They failed in so many different ways, when you look at what they did, and how they did it." NBC Bay Area asked Maria Lopez's real estate agent to talk with us about this story. He did not respond to our request. If you have lost money to fraud in a real estate transaction, we want to hear from you. Please call us at 888-996-TIPS, or via our contact submission form by clicking here.